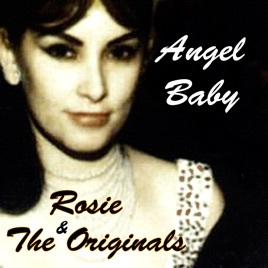 John Lennon said that one of his all time favorite songs was Angel Baby by Rosie & The Originals. 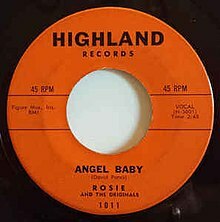 Angel Baby was a doo-wop record released in December 1960 and it would peak at # 5 on both the Billboard Pop and R&B charts. Rosie Hamlin was a 15 year old whose mother was Mexican, her father Anglo-American. She had spent her childhood in Alaska and California. She wrote the lyrics to Angel Baby as a poem for her first boyfriend when she was fourteen living in California. When she was fifteen Rosie and some of her friends rented a studio to record the song. They took the master of the song to a local department store and convinced them to play it in the stores listening booth of the stores music department and the song went over well. A Highland Records scout offered them a contract. The legendary DJ Alan Freed would play it on his radio show- Rosie and The Originals would appear on American Bandstand -she was the first latina to appear on the show. Rosie Hamlin got married at eighteen and retired from the music business. John Lennon recorded a version of Angel Baby for the covers album he did “Rock n Roll” and it was finally released in 1986 when his Menlove Avenue album was released. In the intro John says “Send my love to Rosie, wherever she may be.” Rosie would call it her favorite cover of the song. In 1971 John and his friends can be heard singing the song at his birthday on tape. The song has been covered by a wide variety of artists- Linda Ronstadt, Roky Erickson, Black Rebel Motorcycle Club, Tiffany and many others. On the liner notes of Led Zeppelin’s Houses Of The Holy- following the printed lyrics to D’yer Mak’er” -it reads “Whatever happened to Rosie and The Originals?” Also Rosie shows up in Zeppelin’s song- How Many More Years.” This one hit wonder sure had an impact on other musicians. The Beatles were heavily influenced by the girl groups of the early 1960’s and their sound- not only did they love a lot of those records but you can hear the influence especially on the first few Beatles albums not only when they covered a girl group song but in their originals. Once again, Hans, great stuff.